Browse our large collection of fabrics, to create your perfect White sofa. Whether shades of alabaster, chalk or snow appeal to you, a cool and calming white sofa is a classic choice for indulgent interiors. Imagine your home with the addition of a crisp, white chesterfield sofa packed full of statement style, or perhaps a perfectly practical stain-resistant white velvet sofa bed for surprise stopovers. 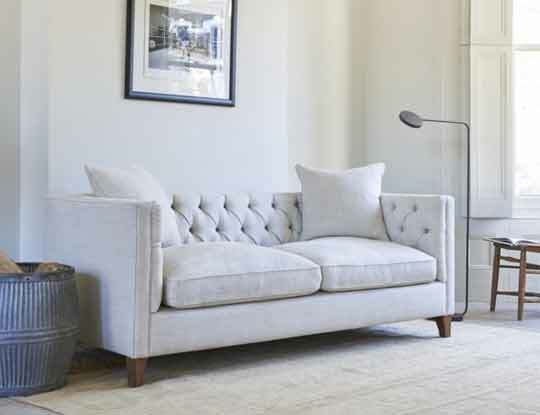 Squashy neutral corner sofas are just the ticket for family time or choose an armchair in a calming and elegant ivory hue if you fancy something soothing for the soul. Whether you’re looking for contemporary sofas or a more traditional style, there is a shade of white sofa to suit all interior tastes. 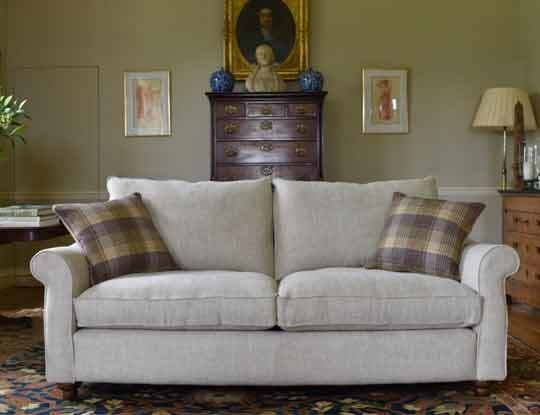 Any of our bespoke, British sofas can be covered in your favourite tone and with expert advice available in both our showrooms and online you’re sure to find exactly what you are looking for. All our Handmade collection are made fully bespoke, to meet your very need. We do not mass product furniture, instead we specialise in personalising your furniture to meet your very need. We understand there is no such thing as one sofa fits all. As such we have several different sofa shapes and sizes, all of which can be upholstered in any fabric in the world. White sofas are thought to be hard to keep clean. As a result families have tended not to go for white or even cream sofas, dispite their obvious style and elegant look in the home. S&S are proud to announce we now offer a wide range of white fabrics in our 'easy to care for' fabric range. Where cleaning your sofa from all sorts of slips and spills is as easy as wiping clean. Why not pop into one of our 12 showrooms Nationwide and find out more about our fabulous fabrics and creating your perfect sofa, at a price you can afford. Why not order some free white fabric samples pack, so you can see the high quality fabrics we offer.